The 7th International Space Syntax Symposium takes place in three sites mainly. The Royal Institute of Technology Campus, Kulturhuset, and City Hall. 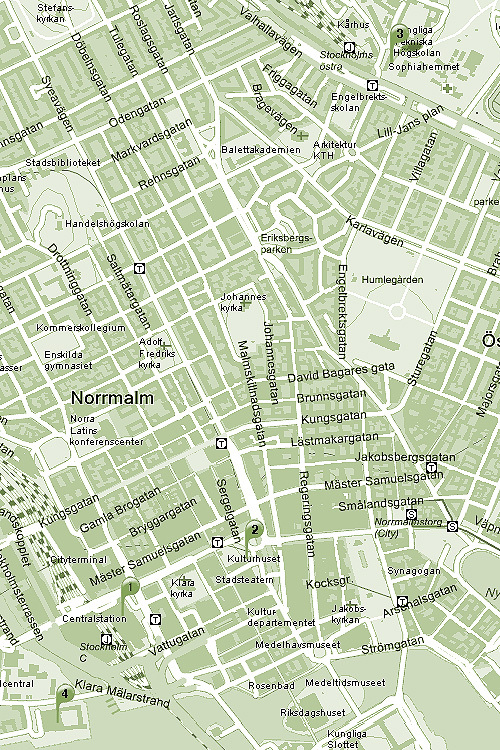 All are within what counts as the inner city of Stockholm and close to subway stations. The Campus lies by the station Tekniska Högskolan, Also known as Östra Station for buses. City Hall and Kulturhuset are close to T-Centralen, or for airport coaches Cityterminalen and for trains Stokholms Centralstation. For the Research Conference, upon reaching Tekniska Högskolan/Östra Station, you should exit to Valhallavägen or Tekniska Högskolan fand enter the KTH Main Campus. There should be signs from the subway exit (and guides on June 9th). A closeup map to print out can also be found here. For the 8th of June Event and Conference Dinner, you exit from the subway towards Sergels Torg, or head towards the skyscrapers along Klarabergsgatan if you arrive by bus or train. Kulturhuset is located on the south side of the square. A closeup map to print out can be found here. The Stockholm City Hall, for the one walking there from the subway or otherwise, is across the bridge continuing along Klarabergsgatan and then turning south. Below you find an overview map with Stockholms Central/Cityterminalen (1); Kulturhuset (2); KTH Main Campus (3); and Stockholm City Hall (4).